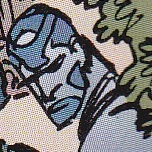 Other Distinguishing Features: Gray skin with blue design work covering his face. Sterno is a member of the Vicious Circle in attendance at a new member initiation. The ceremony is attacked by Dragon and many of his allies. Sterno is murdered by Dart II during her raid on a VC warehouse.